Born in San Francisco, California, Jennifer Hansen studied at the Academy of Art and received her BFA of Fine Art in 2012. She has shown with the Napa Art Museum, Wonderland Gallery, as well as many others in the San Francisco Bay Area. Hansen has been featured on Juxtapoz and Gallery Nucleus. As well Jennifer has a permanent installation located at the Hotel Zetta in San Francisco. 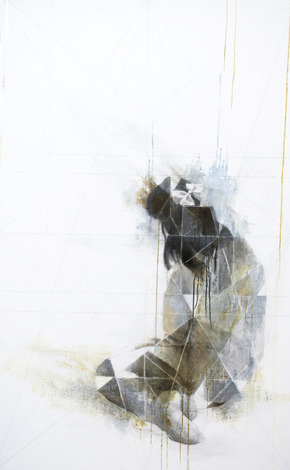 She works with graphite, charcoal, and oil on white gessoed canvas. Hansen's process includes many translucent layers of oil on top of dry media to show each layer and stage of the painting. This symbolizes the complexities of people and how we are each not yet completed; we are a “work in progress." The viewer is meant to be able to “peer” through the window of the person, seeing ones vulnerability and exposing the deep recesses of the heart. Her work expresses human depravity, destructive desire, and suffering in urban, desolate environments.